Whilst on a practice hike preparing for a trip to the Kokoda track earlier this year; I overheard one of the teens on the hike, who had done that particular track before, relate that the last kilometre of our day would be the longest, there was a collective sigh of agreement. So too, it can be with the close of a project, it can feel like the longest part of the journey. There is plenty of good advice on how to face the fear of finishing and close your personal projects… but, what’s the best way to close out a project for a client, leaving it in a good state? Improving my own focus in this area has been the ‘sub project’ (read personal goal) of the last month or so. I am very good at working on multiple things at once but I will get lots of elements to 99% done and then just not wrap them up. It’s hard to finish. For me, it’s always hard to say goodbye to the project team. There’s something about projects that bring people close together (what is it they say about bonding in crisis?) There are some jokes, some situations and some shared experiences that no one else but those people who worked on that project will ever get. It’s a bit like the school trip or group holiday where you’ve been forced together with a bunch of strangers, but through the experience you come to know them better and call them friends; you will always have that unique experience with them. 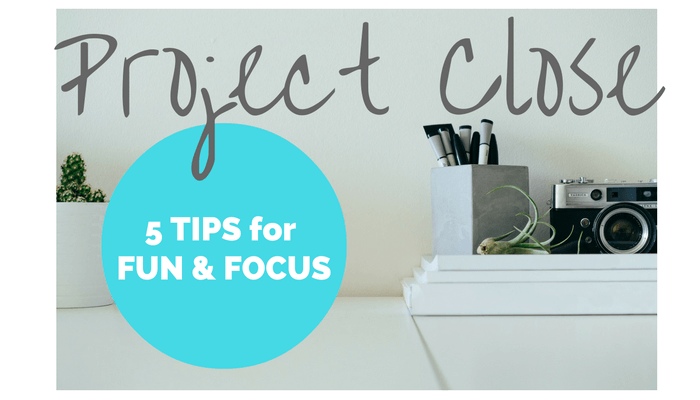 So, in an attempt to improve on project close out, I have made a concerted effort in my most recent project to finish it in a more resolved and structured way, and to do this I have shifted my mindset to thinking about it like a birthday party. Reviewing the project objectives and comparing them to what was imagined at the beginning. Objectives and business goals have changed, so has the business structure and the timeline, but the meat of the project purpose is complete, I am glad to say and is being handed over to the business team. I’m choosing to see it as a before and after shot (a-la room reveal style). Final documentation and folders clean up. Blah! I know, boring! I don’t really have much to offer in the way of making this one fun. I honestly struggle to get inspired about it, but it’s a bit like the spring clean, once it’s done you feel resolved, organised and like it’s OK to invite those friends around that have the house that looks like it’s out of a magazine. For me, the project documents are all stored on a shared drive, so there’s the clean up milestone and then around a month later the day where I disconnect from that shared drive and it is finally archived. Ask for feedback from the team on what worked, what didn’t and what’s next. Janine Garner has always described this exercise as ‘Stop, Start, Continue’ – what should I stop doing, start doing and continue doing. This one is still for me to do, more on that next time I guess. Acknowledge the contribution of the people on the team and put that in writing for them as an endorsement for them. For me, this part is easy. I really enjoy working with different people and teams and can always find something positive to say. If you’re stuck I just start with ‘Thank you for…’ and let it roll from there. Having some kind of ceremony or celebration to acknowledge the milestone reached. This one can be a bit of a political negotiation. Sometimes the client has a clear idea about what they want to do and how they want it to look. So often, one project rolls into the next, so significant milestones can get missed or wrapped up in the focus of ‘what’s next?’ So this is where the FUN element comes in. Thinking about special ‘awards’ for the team, a meal or outing together, just to say ‘thanks’ for the effort, camaraderie and memories. As far as a cautionary tale goes, I had one project the 6R team worked on where there was a team from OS vendor, the client team and other contractors team on the project. We were all on site with the client in the weeks leading up to live and the cut over. There may have been twenty of us. It was a long few weeks of loading data and helping users navigate the new software. The celebration at the end of the week, was an in house lunch provided by the client. They were happy with how things had gone but we were all pretty exhausted and given the size, significance and cost of the project the ‘celebration’ seemed at an inappropriate scale. Whether this was a case of the end had come upon the client unprepared or whether they genuinely thought that sandwiches and juice in the project war room was enough, but it wasn’t. The team felt flat when the celebration was out of proportion with what it’s had taken to get stuff done. I remember going home that last night before the OS team went home feeling a bit deflated and kind of empty, which was an odd feeling at the end of an eighteen-month long intense everyday working relationship that there was nothing there. The problem with emptiness and not acknowledging the contribution of team members properly is that it leaves people with that ‘flat’ feeling. So, learning from that situation, I am focusing on ensuring that there is a sense of people feeling acknowledged for their efforts and cultivating for myself gratitude for the time that I have spent with those I have been fortunate to work with. I am going to miss them. Get feedback from the team on what worked, what didn’t and what’s next. Have some kind of ceremony or celebration to acknowledge the milestone reached (and for goodness sake make sure it’s festive).